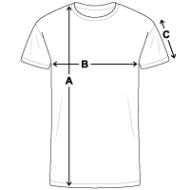 This 100% cotton, classic cut T-shirt weighs 185 g/m². Like the Hanes brand, it is produced by Sara Lee. This shirt has a double-stitched hem and an unbelievably soft surface texture. A classic T.